Y’all. I love this recipe. I love it for two reasons. First, it’s frugal. 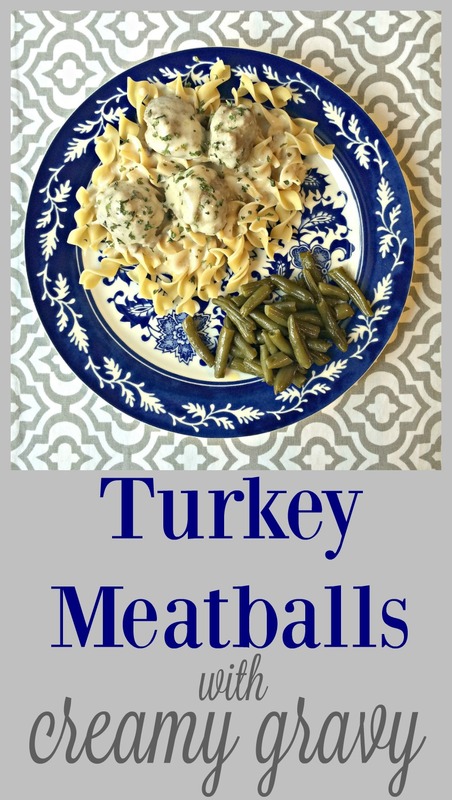 Second, when I make it my husband always says, “That’s what I’m talking a-BOUT!” 🙂 My wonderful Mother posted a recipe for turkey meatballs this summer, and I was so glad to have a good recipe using ground turkey. I can usually find it on sale for $2.50/lb at my grocery store. The original recipe from my Mom is great for turkey meatball subs. However, I also like to serve these meatballs over egg noodles. With the creamy gravy I’m going to tell you how to make, the comfort food level is over the top! Mix turkey, onion, garlic, salt & pepper until combined, don’t overmix. Form into 16 meatballs (for mini-meatballs form into 1-inch balls). Heat oil over medium-high heat in a large ovenproof skillet; add meatballs and cook until nicely browned on all sides (about 10-12 minutes–reduce time by a few minutes for mini-meatballs.) When cooked, transfer skillet to oven and bake 5 minutes. Be careful not to overcook! Transfer cooked meatballs to a plate and cover to keep warm. Leave about a tablespoon of grease in the pan, return to stove top (remember that the pan & handle are hot from the oven!). Add chicken broth, bring to a boil and cook for about 5 minutes, scraping the bottom of the pan as you stir. Reduce heat to low and add the cream of chicken soup. Stir until well incorporated. Simmer for a few minutes until the sauce is creamy. You may want to add a splash of milk to loosen the sauce if it’s too thick. Return meatballs to the pan and cover with the gravy. Serve with hot, buttery egg noodles. Garnish with a sprinkle of dried parsley, if you wish. Trying this tonight 🙂 Thanks for the recipe!! I’m happy to share it with you! Hope you love it as much as we do! I love turkey meatballs, but usually purchase through Trader Joe’s (quite good). I once tried them at home and failed miserably using a recipe given to me in a grocery store line from the customer behind me. They were so bad, they weren’t eaten and were tossed. Your recipe & picture look yummy, yummy with that creamy sauce on top. Will definitely make these.